As human beings we have a need to categorize and structure the world around us in order to make sense and understand a rather complex contemporary time. Lately I have encountered readings and debates around the distinction between activism and journalism. These have for decades been considered separate entities, rarely collaborating and working together. But nowadays we are many who address these distinctions and critically try to elaborate on how we can move these practices together. There is a place for activism in journalism. Or maybe activist features rather than proposing an abandonment of journalistic norms and values building on seeking objectivity and transparency. And the latter should be more in focus than the former. We (as in a questionable generalization of the general public) are slowly sharing the notion of objectivity as a utopian notion and ethical marker for journalists to strive for, rather than a reachable and realizable vision. And if we acknowledge this, then where do we draw the line between journalism, activism and other kinds of production and distribution of speech and stories? Is it even necessary to make these distinctions? Well, yes and no. I firmly believe that there is a place for activism in journalism. This would not mean that journalists are to abandon the professional ideals from which the profession originates. On the contrary. By turning towards the democratic dimensions and fundamental ideas of progression which drives activists, both in political and media spheres, journalism can develop into a natural and integral part of the civic engagement taking place to improve democratic health. This is especially important in countries with greater problem of political accountability, government censorship and oppressed opposition. In many autocratic states, governments define journalism and activism as counterparts. Journalists should support government policies and activists oppose them. And maybe this definition is valid even in more open societies. Not that journalists per definition are to maintain status quo (even if there are arguments for this as well) but that activism is a mean to oppose power and promotes non-democratic methods for doing so. Therefor there is even a greater need to redefine and integrate these two binaries and discuss how journalistic institutions can decrease the gap between citizens (many engaged in activist movements as the alternative political sphere to some extent engage citizens more extensively than traditional political parties) and the social and political influence of journalism. After all, journalists are already an important factor in the struggle for press freedom around the world. And as a broader struggle takes place around the media sphere, a struggle for freedom of expression and further demoractization processes (mainly by activist organisations) – journalists should be a more decisive actor in this struggle as well. Take the example of persecution and threats agains journalists/correspondents around the world. Pleading for basic human rights of these colleagues has become an integral part of the journalist profession and ideal and an important dimension of the discourse surrounding press freedom. But as the boundaries of who is journalist and who is not have been transformed and the distinctions are blurred – who are not a part of this? Should journalists stand up for the greater cause of freedom of speech (including non-journalists and activists) or just come to the defence of own colleagues? As should be obvious, I strongly argue for the former. Bring activists and journalists closer together, not just through conceptual understanding but in practice as well. This would not mean that the individual journalist looses his or her professional identity and suddenly becomes indistinguishable from social media advocates and bloggers. The question of where to draw the line between journalism and activism should be up to the individual journalist and activist to answer. Government, democratic or not, cannot interfere in this distinction and should be kept away from such attempts. We live in a global information ecosystem. Journalists, activists, NGO:s, Human Rights-organisations and citizens. Let’s bring nodes in this ecosystem closer together and collaboratively take part of the broader struggle for freedom of speech and other democratic ideals. I have tried to streamline this blog and will from now on frame it more towards my current research and interest in dimensions of media activism. After two articles/chapters published during the recent year about the democratic functions of using social media and online video streaming as tools for social change and challenging authoritarian states in the Arab world, I have now started working on a new article in which I turn to the opposite side of using media technology for enhancing democracy, namely global extremist groups and their use of both digital and analogue media for recruiting and radicalizing potential supporters. In this article I perform a discourse analysis of propaganda material published by the Islamic State (ISIS) in order to see how this organization discursively construct religious claims to justify actions, forming a caliphate and attempts to reach out to foreign fighters to join in Iraq and Syria. I also discuss the online responses to these strategies, predominantly made by western governments. Hopefully I will finish this work by 2016. 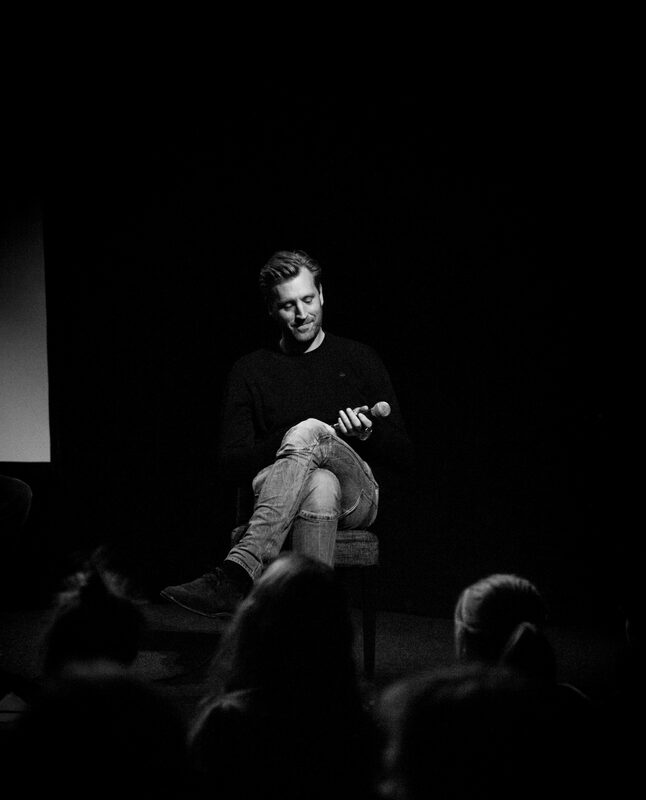 If you are interested in the subject you can watch one of my recent presentations/lectures here. During this process I will use this blog as an outlet for ideas and thoughts concerning my ongoing work. You are welcome to join me either here, on Twitter or Facebook. The debate on the vitality and threat to freedom of speech and expression, including the most effective strategies to defend its practice, currently proceeds across large parts of the democratic world. The more right we give to individuals to feel offended, the more moral justification for violent responses within this right emerges. Freedom of speech should never be restricted or related to the individual experience and right(?) to feel aggrieved. Instead, this privilege to express opinions has to be a fundamental part in a larger democratic discussion and development characterised by a holistic approach towards society. The risks of safeguarding our right to express and simultaneously restrict the width, will be that we unconsciously trigger and make way for islamophobic and anti-semitic tendencies. To mock a religious profile, or to criticise religions and valuegrounds, are not necessarily the same as attacking minority groups. Far from it. I would never pretend to know what causes organizations or fanatics to commit deeds as the ones we have witnessed and experienced in Paris and Copenhagen recently. However, I believe any type of violent act of that kind fundamentally concern our relationship to one another. Senses of fear and social divides fuel radical actions, and that also include expressing opinions and the nature of public debate. If there is a perceived insecurity, coupled with exceeding limits regarding ethics and morality, pushing for provocation and polarization, the public debate (as well as social life in general) toughens. Religion or ideology becomes weapons for taking the edge off the opponent, often with highly polarized and provocative formulations. But what is the actual affinity between characteristics of public debate, freedom of speech and fanatics using religion as justification for violence? Well, looking at the highly intense debate regarding the role of freedom of speech and whether or not one should provoke by making fun of religious figures, some characteristics emerge. On the one hand there is a consensus in the condemnation of the attacks and a defence of the freedom of speech (ie support for the right to criticize religions, in the same way that we have freedom to practice a religion we have the right to make fun of religions in accordance with the freedom of speech). And in this final standpoint, the personal integrity and individual right of feeling offended enters. But just because someone feel offended it doesn’t mean they’re right. Again, if we are to structure society after the risk of individuals feeling offended and put that risk in relation to the overall idea of freedom to express what is within the arms of the law, well, I just don’t see how that would enhance democracy. With this argument I critically approach the other dimension of this debate, namely those who strongly argue for freedom of speech through “yes we have the right, but it is not the time to provoke right now given the current state of society”. If this becomes a collective judgment, I believe it will not only confine but also have a more severe damage to open society than terrorist attacks actually carried out as partially a consequence for our provocations of religious characters. Yes, with freedom comes obligations and our freedom to express must in practice be guided by common sense and responsibility. But, I find it hard to understand the surprisingly strong voices in the current debate arguing that we who express something, at the same time should be responsible for how others perceive and interpret it? No, we are not. And we never should be. It becomes problematic when the individual interpretation, and the right to feel aggrieved and offended is given precedence over the collective right to express an opinion, which of course will move within the borders of the law for nearby areas of for example hate speech. And perhaps the most important aspect of all, the rights and responsibilities in a democracy must be tested, otherwise we do not know whether or not they can be applied. That being said, let´s finally turn to the actual role of the exercising of freedom of speech. In light of the recent events in Paris and Copenhagen, I believe we should ponder the meaning we choose to ascribe the right to mock religious symbols or characters and the utterences themselves. Is it realistic to believe that it is our safeguarding and exercise of freedom of expression (especially the specific illustrations being debated right now) should be considered crucial mechanisms for attacks like the one against Charlie Hebdo or the meeting in Copenhagen? Extremely doubtful to me. Rather, we should probably aim our attention to other social, political and cultural issues to protect our democratic ideals. Debates on freedom of expression are rarely productive in the sense that we are debating with basically total agreement on the most basic core values: the right to express an opinion within legal limits. In the next stage there is, as shown above, difference of opinions regarding how to best use and develop this freedom. But it seems quite far-fetched to believe that organizations of ISIS character in a decisive way would bother blasphemous caricatures or the critical writings about the prophet. It may certainly has some form of triggering of and targets of certain attacks (as Charlie Hebdo showed), but I am rather convinced that to somehow understand the structural violence and terror attacks, by organizations using a pretext of religion, has far more central factors than an eagerness to defend freedom of speech in the west. As soon as we equate the violence by ISIS or other fanatic groups with islam, we walk out onto a slippery rope. For no, even if these groups use islam as a justification for actions, it has very little to do with islam. No religion is violent or good in itself. It’s a religion. If you bring violence into your interpretation of islam, christianity or buddhism, then your islam, christianity or buddhism becomes violent. If you bring in peace it becomes peaceful. Religion in itself has no value. It is people´s approach to it that results in a value. And that may differ substantially. No, rather than wrongly categorizing structural violence along prejudices and ignorance, our quest for ways to respond to threats to democratic society must go through dialogue based on knowledge about the difference between for example fanaticism and islamism. 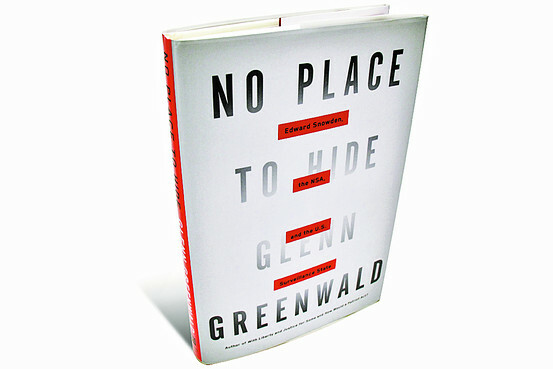 So, starting off the new year with a reflection on this book on surveillance society, named No Place to Hide: Edward Snowden, the NSA, and the U.S. Surveillance State (link Amazon), written by Glenn Greenwald. It is a compelling story, almost like a thriller mixed with opinionmaking material criticizing the surveillance society and makes no secret of the authors compliance and cherish for Snowden. The book is basically divided into four parts concerning respectively the Snowden events, the journalistic process, the content of the released documents and finally the consequences of mass state surveillance. The latter is also mixed with some sort of analysis of the american political and journalistic system, everything made from a perspective of power transformations. 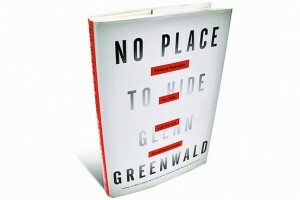 The most interesting is not how Greenwald functions as a storyteller, but rather the content of the book as a contribution in a larger political discussion on authoritative and state power exercise and how technology (ie surveillance technology) is used in these processes of upholding and expanding power and control. The justification from CIA and the US administration derives from the post 9/11-fear and mainly states that surveillance is necessary to protect US citizens. Now, there are a few problems with this justification argument. The integrity of non-americans is totally lacking but also the legal protection of american citizens is negligible. Basically, what Snowdens documents have revealed, is that the NSA has access to email conversations, phone calls, chats, social media content, and can easily get court permission afterwards to wrap up the legal justification. Greenwald argues here for a severe breakdown of the constitutional/juridical system when agencies (NSA) basically without reason are permitted to monitor citizens without substantial legal evidence. And it gets even more interesting when his analysis of the emergence of a surveillance state ends up in a discussion of class and increased divisions in society. When rich people increase their wealth and poverty and social problems increase on the other side of the scale, a choice is given to the state. Either the political powers take measures to decrease the divisions and promote social equality, or they develop strategies to maintain a status qou and keep citizens calm to avoid civil unrest. Greenwald clearly emhasizes that many countries, and US in particular, keep going for the latter. The escalation of surveillance is an extension of this choice. To support this claim he aligns with convincing research on how any state surveillance diminishes freedom of speech and strongly weakens democratic health. The story of Edward Snowden, the reflections and analysis of surveillance is adequate, and I believe the book serves an important purpose. No matter if you are left or right, if you support or reject state surveillance, the book still contributes with an interesting contemporary narrative on current society and especially on the relation between political state power and individual integrity within the framework of democracy. Just to prove to those who follow this blog that it is not down, I have not left, I am still alive and kicking (sort of) and will, through same procedure as last year, try to update more frequently during next year. As I have read and tried to understand the Quran, I have a deep interest in trying to relate current discourses on Islam and especially those who claim an islamic faith and rhetoric however have very little to do with the actual writings of the Quran itself (no matter the justification of interpretative freedom). The emergence and continuing spread of ISIS is such an example. In this post I look into the US State Department strategies to meet and counter the propaganda machine of ISIS on social media platforms. In an earlier post I recognized the media strategies of ISIS and the rather wide array of outlets for propaganda and mobilization efforts through the use of social media platforms. These efforts have been ongoing for years and still enjoy an increasing number of followers (not only by pro-jihadists and supporters, but a morbid curiousity by a general public as well as several academic approaches and journalists). I have written about this side of the information war earlier and you can read that post here. 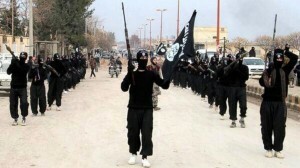 But what are the countering strategies from the US as the most evident enemy of ISIS? Reports on the political actions taken by Obama along with allies in the UK and other European countries (as well as the Iraqi government) are several. What has not been very visible in the news coverage of the counter reactions to ISIS progress in radicalization, reqruitment and mobilization, especially through social media channels, is the government response on the same platforms; how the US administration are working to neutralize the exceeding radicalization strategies on the Internet. And why hasn’t this been more widely discussed? In dec 2013 the US State Department initiated a social media campaign called ”Think Again Turn Away” as a venture to win the hearts and mind of jihadists (and potential jihadists) around the world. The stated purpose is to obstruct diasporic communities to join ISIS and other forms of jihadist organizations. The campaign started in Arabic and Urdu already in 2011, in Somali the year after and an English version was launched in 2013. Since then, The State Department manages precense on the most popular social media platforms (Twitter, Facebook, YouTube, Tumblr etc.) and the campaign is a clear result of an increased Arabic pro-militant prevalance on English-speaking social forums. To this day the Twitter account has roughly 13 000 followers, the official Facebook page has about 8 500, and the YouTube account is followed by 2800 people (the number of views on the posted videos are often much higher though). I consider these numbers very low (in comparison to the number of attentio that ISIS has managed to get), however, the tactics used on these platforms are much more interesting. Let’s take the Twitter account for example. Two strategies are used. 1/ writing counter messaging and content (referencig to the material being published by ISIS), and 2/ adreesing accounts in differnt ways connected to ISIS or simply pro-jihadist outlets. The first one can be illustrated though this video (”Welcome to the ”Islamic State” land (ISIS/ISIL) ). As we have witnessed several times before, the video material coming out of ISIS media factory (al-Furqān Media) has a tone of familiarity and doesn’t necessarily have an overall confrontative approach, atleast not directly. There are other factors than just the struggle against infidels that are being emphasized. Rather, they play on a social pathos of mission, familiarity and belonging. The US State Department have chosen a strategy to parodize the content of these videos and tries to exhibit sarkasm in their approach to ISIS material. As can be seen in the video, for example a text saying “Travel is inexpensive because you won’t need a return ticket!” is showed and superimposed over a series of bloodied corpses. The second strategy of using Twitter in the campaign, seem to be to adress and engage discussions. This is not only ineffective, but also an immediate advantage for any type of radical group using every mean possible to spread a word and manage the public perception of their operations. In an article in TIME Magazine in september, a couple of examples of how the Twitter account of the campaign are used as counter messaging and initiating discussions. Following a couple of messages of support, the Think Again Turn Away account responded, “US troops are punished for misconduct, #ISIS fighters are rewarded,” along with a collage of U.S. soldiers interacting happily with children in the Middle East. Even then, Think Again Turn Away persisted through the conversation, tweeting, “This is what children see under #ISIS rule, this brand of honor and respect,” and included a picture of children standing around a crucified soldier in the street of an unidentified city. So, thirteen years into the war on terror, and almost ten years since the breakthrough of social media platforms, this type of US response and tactics surrounding social media readicalization, is to me quite staggering. By entering discussions on who has killed most innocent muslims (with a purpose of fighting radicalization of new reqruits), the US State Department not only exhibits a lack of understanding for how online reqruitment actually works, but also provides a platform and space for ISIS (or other similar groups) to expand. In addition I firmly believe, which also can be argued from the side of ”psychology of terrorism”), that these type of countering strategies tend to trigger and stimulate young adults to turn even harder towards radical groups, hence the whole strategy backfires. The campaign Turn Away Think Again, despite the good intentions of countering radicalization online, has developed a space to ridicule the effort itself. Even if this is not my intention with this post, I still find the whole strategy of the campaign to illustrate a lack of understanding of what mechanisms are at play in online radicalization and what characterizes the involved processes. Efforts from in this case the US pursuing to limit the radicalization of new followers to ISIS, need to be conducted from authorities of trust and not evident combatants in waging a war of both ideological and physical dimensions. It is hard to see why efforts are not directed more to the democratic communities of the Muslim world, bridging and gain from the voice of authority that Muslim leaders around the world actually have and a faith of younger muslims who feel alienated and insecure due to domestic political faults. Enagaging in dialougue instead of countering arguments on Twitter would certainly be a far more effective way to strengthen the relation between state authorites or democratic institutions and Muslim communities around the world. 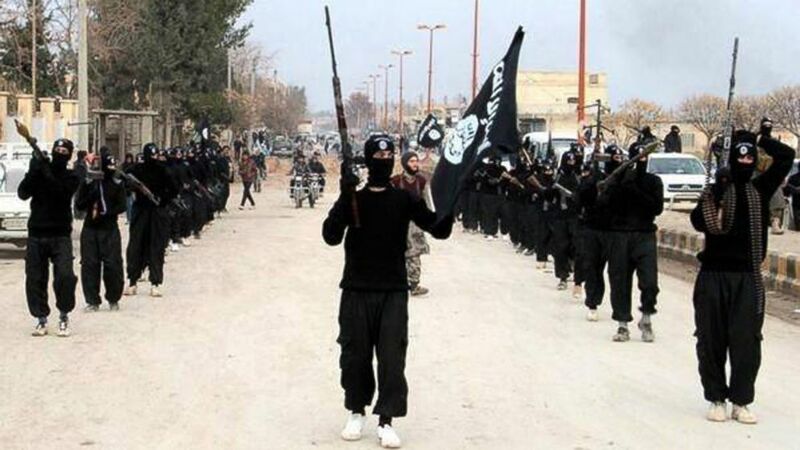 This is perhaps even more important in Europe as many of new foreign reqruits travelling to Iraq and Syria to wage war under the flag os ISIS are citizens of several European contries. 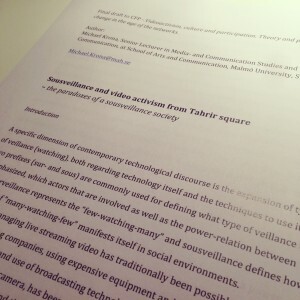 Yesterday I submitted a final draft for a chapter in a forthcoming anthology on Video activism in the age of networks. My text evolves around the use of mobile technologies and applications to stream moving images live with a potential global reach, situated in a pretext of protests and political turmoil. The case in this text regards Egypt and the demonstrations during early 2011 at Tahrir in Cairo, one of the most recognized and symbolic events of the so called Arab spring. The aim of the article is to enhance current discussions on how resistance technologies, as it’s often labelled in both media- and academic debates, can refer to more than just appraisals of social media as tools for liberation or as ‘freedom technologies’, but also serve as a conceptualization of more long-term structural and social threats to society, especially an incrimination of public spheres (offline and online). 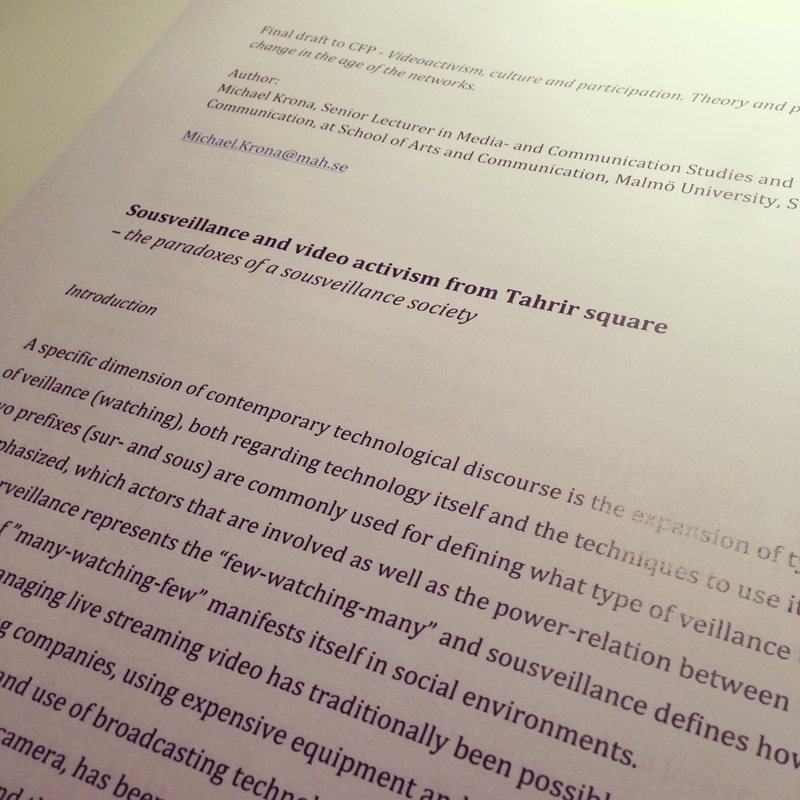 My approach is mainly theoretical, drawing on present research on media- and video activism and sousveillance society. The latter constitutes my main entry-point when trying to comprehend not only the democratic aspects of video activism, but also the consequences regarding increased surveillance practices performed by oppressive regimes in the Arab world. For instance, I discuss the activists’ use of online video-streaming as part of a “surveillance arms race”, a battle in which activits increased use of cameras in cellphones monitoring its oppressors/surveillers, triggered the regime itself to use more drastic measures to take control of technology and information. This in turn led to activists and protesters to develop new strategies for distributing images mainly to an international audience and reach out to the international community, which naturally again led to even further interventions by the regime and police. Hence, one of my arguments is that the use of sousvillance technologies (with democratic intentions), may lead to increased surveillance by the opponent side, talking drastic measures of obtaining control, often hurting more people than those taking part in the actual protest. Now, this may sound pessimistic or bleak. However that is not my intention with the text. My intention is to extract some key features of the “discoursive constructions of liberation technologies”, the way we think and talk about technology in a specific context, and discuss dimensions moving outside the often very optimistic nature of technological discourse (especially during the Arab spring where democratic reforms were sought). This does not mean that I oppose or don’t acknowledge the major significance that social networks in general, and online video streaming services in particular, have had during the uprisings. I have written about that as well. But in this particular text my focus is more directed on the tactics and counter-reactions from the surveillers as well, in this case states, regimes and police authorities. Using video activism as a central part of mobilising and coordinating efforts have proven to be extremely important for social movements and other organisations seeking social and political change. However it is my firm belief that if the technology are to be used as effective as possible and contribute to a more long-term change, especially in the MENA region which is of interest to me, we need to widen the concept of resistance technologies and also observe the social implications when the surveillance society and institutions react to a development. The current outbreak and spread of ebola devastates villages, towns and countries in western Africa. Journalistic outlets are filled with information, speculation, advice, numbers, graphics, experts, non-experts and a seemingly compulsive fear of what ”may happen” if the international community can’t break the rapid spread. Few reports retrospectively emphasize the devastation the virus already created in for instance Liberia. Instead the presumed attention span of media consumers and international/western audiences is framed as short, present and futuristic at best. This allows for a majority of news journalism editors to embrace a narrow and widely dangerous sense of fear in the reporting. Now, critics would of course suggest that it is too dangerous to send journalists to the actual countries to report from the ground (hence a lot of domestic specualtion) as well as point out that the global migration is a catalyst for a viruse to spread even further etc. Of course these arguments are valid, however there is still an underestimated need for discussing the role of journalism and sharing of information in these times, in these type of events, proceeding with major human losses, not least in the handful of countries in which ebola has now gained foothold. I experienced the above mentioned fear when I visited NYC a couple of weeks ago during the first case of ebola reaching the US, more precisely in Dallas. I sat down in JFK International Airport waiting for my flight to London, and the television sets at the airport predominantly showed CNN live coverage of the specific US hospital that the infected person had been treated in, left from, what domestic flights he had taken, the attempts to find his fellow passengers etc. Most of the visual material in the coverage consisted of ambulances, sirens, people in protective suits, masks, gloves, road blocks and other elements fitting the story of how the virus will be a major threat to the nation and after that of course, the world. Very little attention was aimed at the original outbreak in western Africa. And I could notice how people at the tables in the airport, all intensely following the events on the screen, started talking to each other, discussing the measures of how to contain, the possible progression of events, the threat it poses. They ventilated fear and anxiety. And I thought to myself how the framing of information in times of insecurity and human crisis, so easily can expand to a ”discourse of fear”, a way of thinking and approaching a problem. Just take this screenshot from CNN as an example. The analogy used is ”Ebola: The ISIS of biological agents?”. Now, it doesn’t really matter what is true or not, the damage in this situation has already been done as the headline connotations in contemporary society (perhaps especially in the US) are rather given and not af a positive nature. On the contrary it connotes nothing but fear and threat. Hence it expands models of thinking about ebola and in the long run of course narrows rational handling of a situation. The rather extreme graphic and message on the screen behind the two persons in the studio, I am not even going to discuss further. But news journalism on major networks does not stand alone in this exaggerating approach. Several cases of outburst and viral notions of panic have also occured. With the exception of a few cases in for example US and Spain, the ebola virus is still contained to western Africa. This does not however stop rumours and insecurity to spread through social media in other countries around the world. In a Chilean hospital a couple of days ago, a speaker voice expressed a message to the people inside the hospital saying that they had a suspected ebola-infected person and kindly asked people to get out of the hospital and go to another one. Someone filmed this event and put in on Youtube. In less than 24 hours the video had been seen by 120000 people. Soon the rumour went to Twitter and other social networks. With hashtags suggesting there was now an ebola outbreak in Chile the information grew, spread and of course was also picked up by mainstream media, expanding the fear. The problem (or the relief) is that what happened, was that the patient in question had been to Equatorial Guinea (where no cases of ebola have been suggested) but someone had confused this with Guinea (which in fact currently has a spread of ebola). These are however countries over a thousand miles away from eachother. In any case, what we are experiencing is, in all its danger, a growing sense of fear, anxiety and panic around several continents. The importance for citizens to obtain balanced and correct information does not need to be stressed further. There are of course examples of more accurate and substantiated coverage in traditional news journalism, as well as on social media channels, but the accuracy and balance in information and news about ebola, is clearly to a great extent still upp to citizens themselves to create and manage, by consuming news from several sources, wage against eachother and take action from it. And in this process, the awareness of how easily misinformation and unecessary speculations spreads, must be maintained. So I’ve just spent time with my daughter. Watching her play, laugh and empower the world around her. Everytime: the best time of my life. It never stops. She is all that is good and innocent in my immediate surrounding and life. After her bedtime, I sit by the computer and run through the daily news and events. A video comes across my flow. It is a compilation of undescribable scenes from the recent strikes in Gaza. My heart rises and chest aches for what evolves in front of my eyes. Dead children. 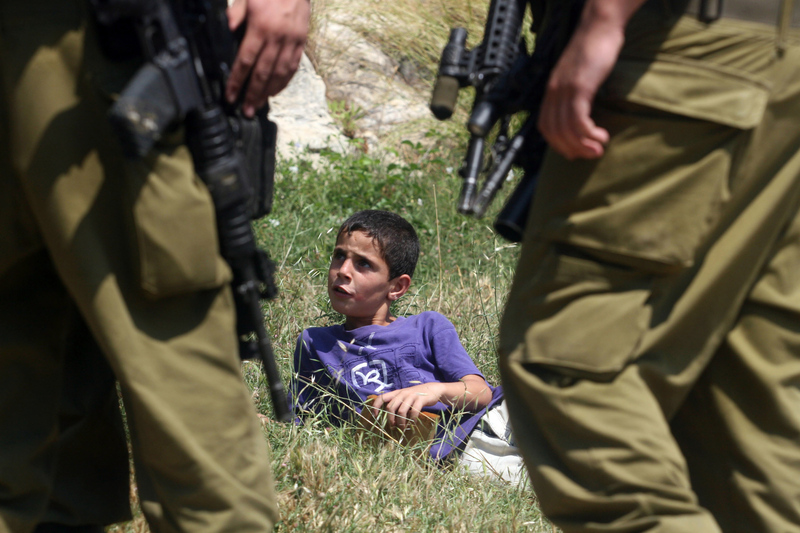 Molested infants and their parents, former lively citizens on the streets of Gaza. The victims of for us, meaningless violence. The conflicts taking place in the Middle East are hard to comprehend, for several reasons. One cannot however isolate the humanity from knowledge. Without knowledge I believe humanity, in its greater potential, is impossible to reach. Or is it? I will come back to this at the end of this post. Too many people say they don’t have time to learn and engage. Too many people say they feel empathy, but they don’t do anything about it. But videos like these must surely empower some emotions? I teach a lot of visual language through moving images, about how the shaky amateur video signals authenticity, that the visual language of user generated content through handheld cameras give the impression of proximity and reality. Through Youtube, Bambuser, Ustream – the world has become visible, for better or worse. We can continue to turn our head, but we can also choose to see. See the world. See what we so easily distance ourselves from. The things, the stories and the people we do not know. What we fear. And I despise the religious rhetoric that no one would be innocent; an idea built on ancient texts with apparent truthclaims. Look at these children. See how palestinian families wake up every day to fear of losing everything they have. Observe the results of the Israeli war crimes. I don’t need to rely on Islam to state the obvious. Nor am I obliged to have read Dante to say that guilt has several grades and dimensions. We are all guilty to the suffering, even if it’s on totally different levels. Not just those who act and commit the deads, but we who passively observe as well. Compassion, empathy, humanity and involvement can be demonstrated by both small and large incentives. We can share videos like this through social media, we can help to get attention in more ways than through the eyes of tightly controlled journalists. We can donate money, we can engage in humanitarian organizations. Above all, we can increase our interest and knowledge about the conflict. I’m not the best of people. I do not always practice what I preach. But I put down my soul in trying to teach and discuss how parts of the human development work, on the condition of the world and how we can understand the world and actually act to make a better future for others and ourselves. My biggest commitment regards the Middle East and northern parts of Africa. Obviously there are certainly greater needs for attention to other parts of the world, where countries and conflicts lies beneath the mainstream media radar and not even getting a notice in the newspaper. But still. I look at the video once more. But this time I cannot finish. This suffering that has gone on for so long, between Palestinians and Israelis, with the intersection of the Gaza Strip, is fairly unique in our history. And since I am aware of so many people who no longer raise their eyebrows over headlines about new rocket attacks, over standardized articles in our newspapers about people who suffer while political powers can not even sit at the same negotiating table, I become even more convinced of the importance of new information outlets, above all things the social media emergence. The opportunity to witness and share the misery in order to raise awareness and at best get more people involved and the surrounding world to put pressure on the political establishments. I get even more determined that my small contribution to this world, when teaching and writing about these issues, trying to reach out, is what I am supposed to do. I am resolute in continuing to learn Arabic, to develop my understanding of the conflicts, to work methodically to discuss with students here on how participation is possible, how resistance is possible, not least thanks to the media technological development. My interest in communication and technology goes hand in hand with my interest in political and social development. No matter where it takes place. I want to look my own daughter in the eye and stand for my beliefs and attempts to contribute in the best way I can, and tell her that I at least try to live what I preach. Even for issues beyond her and my way of life. And when she told me this weekend that a new girl is starting her class, a girl who has fled war and conflict in the Middle East region, we discussed the importance of helping, of welcoming and make her feel at home here. And trust me, when my baby girl stressed these issues (telling me that she and her friends already thought of this) even before I got the chance to preach for her, I felt more pride than ever before. Talk to people, show them what humanity can be. In conflicts far away, or in the safe everyday life. Sometimes we just have to listen to children to learn for ourselves.